I got a lot of good finds this past week so I decided I'd finally make a thread to document them. Also if anyone really really wants any of the dolls I picked up, I may be willing to sell (unboxed) for the price I paid + shipping. I get the dolls to repaint later, so I'd feel bad if I wiped a doll someone's been searching for! 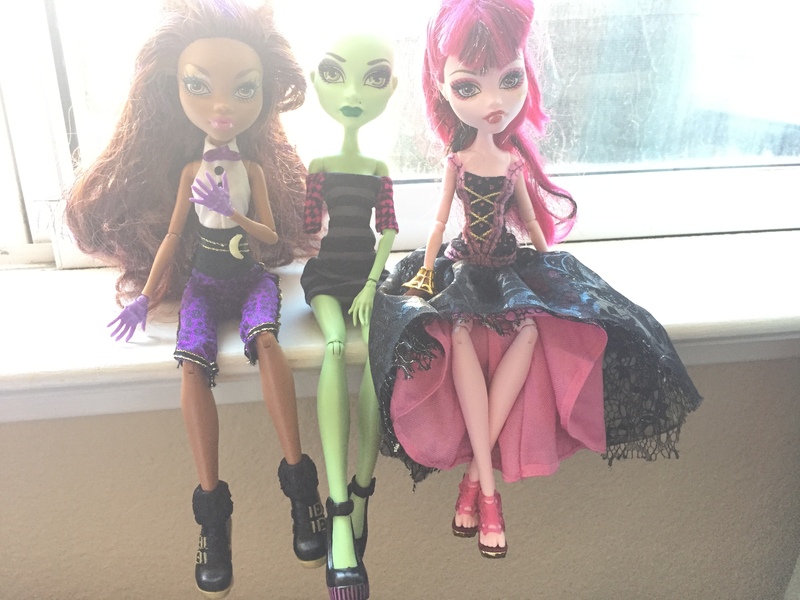 And due to my lack of restraint, I'm likely heading back to grab the Frightfully Tall Clawdeen they had for $15 (Edit 3/6: I bought it). The main tall doll I'm waiting for is the Shriekwrecked Gooliope, but TRU still has it full price. All the dolls aside from MH seemed to be on clearance. However, I found a $10 Freak du Chic Gooliope hiding at another WalMart, that was an exciting find! Certainly made up for not finding a good deal on the other one. And though it was quite some time ago, I'd say some of my most exciting finds were $4 BYBY Operetta and $8 Scarnival Skelita. Love both of them! None of my friends really care so I've always had to contain my excitement. No more! Big congrats on your haul and shopping good fortune! Thanks for such a good rundown on what you got and where! I also swung by a Tuesday Morning yesterday (Sunday), also got Brand Boo Students Batsy & Kjersti (sadly no Isi, maybe I need to go back and look some more now???) - they ARE fun! They also had a number of Great Scarrier Reefs, I got the only Posea. And one lone EAH Farrah. With a STAND! Have you decided who's getting a makeover first??? Thank you! I'm very excited about them, and especially now that I have a place to share! I actually had started on a Dance Class Lagoona I got from an eBay lot quite some time ago. Unfortunately I had purchased a sealant that didn't grip the pencils well, and by the time the proper sealant arrived, I was far too busy to start it up again. So I have a poor faceless Lagoona waiting for attention, but it's likely going to have to wait until after I move. After that, no idea, but I've got plenty of used dolls that could use some cleaning up and TLC that would make nice candidates for faceup practice! Isn't that the truth! Time, money, resources. The eternal equation. The Walmart I work at never seems to have anything good on clearance. ;____; Some of the Barbie Fashionistas were $5 but none that I really wanted, and I did see the blue dress holiday Barbie for $9 but by time I was considering her she was gone. Everyone else always finds such good deals. Congrats! 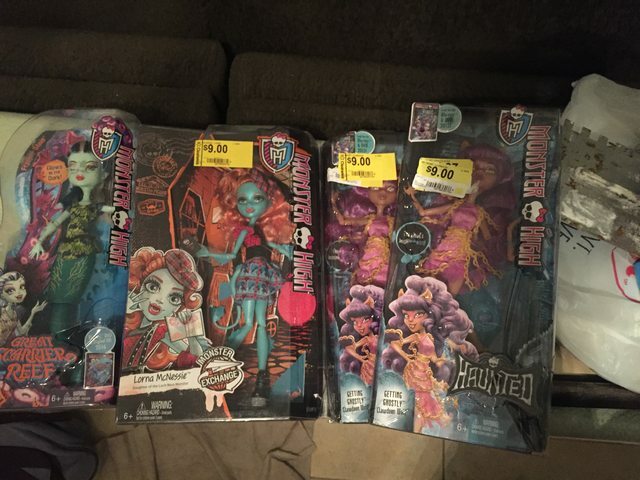 It took quite a few WalMarts to find anything good, the closest one to me only had Gloom Beach Draculauras (even though Brickseek said they should have had Venus as well, which is what I was looking for), and most of the stores didn't have any dolls at all in their clearance. Hopefully something pops up near you soon! The stores where I live never price down. All the dolls, old or new collections are 34,00. Congrats! Major congrats on that Frankie! $5 is a steal! Like I get that she was going off of lowest Amazon pricing, but don't say $10 if you're going to charge $50! It's here it's here it's here it's here it's here it's here! I always get sniped in the last seconds of any auction so I'm super ecstatic I nabbed alll of these for $34! Sorry for the poor quality pictures, in the middle of a move and can't get a good photo spot set up. First up, my Ghoulias and Operetta. Out of attainable/main ghouls, these are probably my favorites. 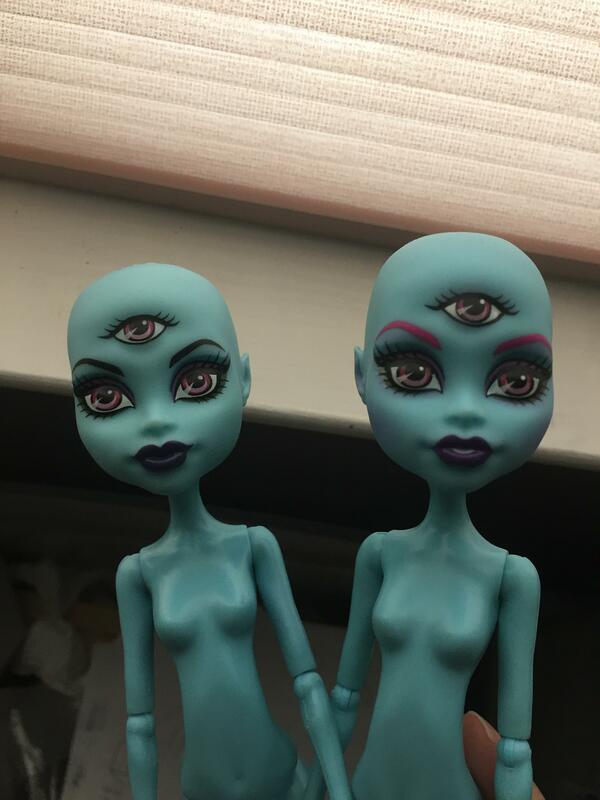 As I mentioned in the thread about wanting more dolls of specific characters, Operetta's color scheme and aesthetic match me perfectly, and I absolutely love Ghoulia's face mold, perfect for an aspiring customizer! Dead Tired Ghoulia's hair got taped a bit in the package, but not that big of a deal to me, they'll be getting some TLC sooner or later. Please ignore Operetta flashing the camera. Ohhh my goodness I was so excited to see her! I don't even care that she's incomplete, this was such a good price! $34 for 7 dolls, that's like a $5 Cupid! 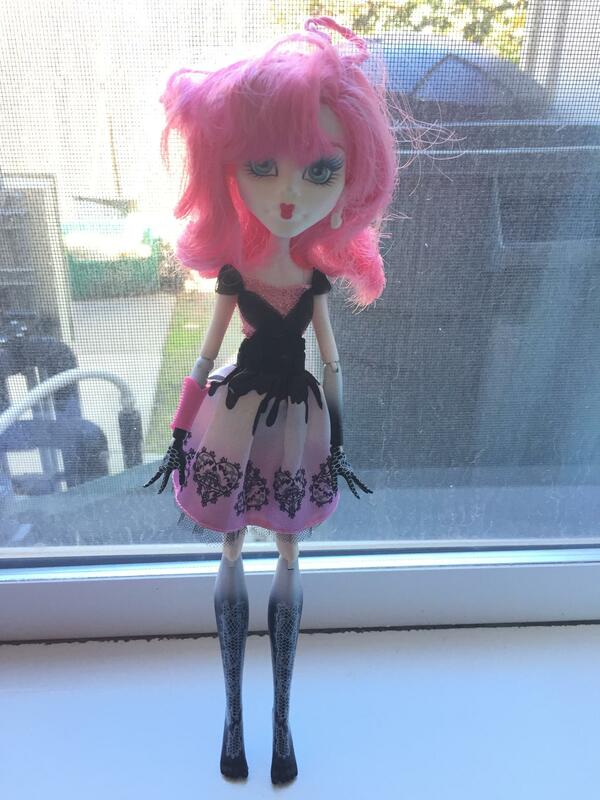 Plus she has that same type of face as Ghoulia, and I adooooore the lacy designs on her limbs. I'm so excited to be working with these in the future! I have another lot purchased through here coming in the next week or so, and that's of course getting posted as well! Big congrats on your new Ghouls! Yay! 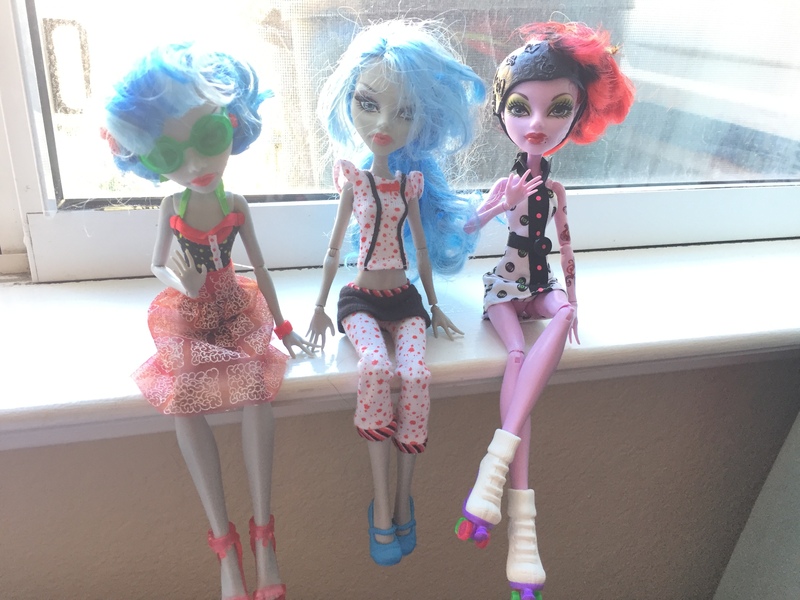 The Ghoulias and Operetta look to be in very nice shape, yes? And that's a very nice Cupid score!! The first time I saw that CAM witch in a pic, I developed OCD...Obsessive Collector's Desire. Tracked one down, I did! And my lot from Abbinormal just came in today!!! I was really really excited for the CAM girls, especially the triclops. One was sent as parts, and I had a torso and upper limbs to complete it. I also just now realized I was so elated that I attached her legs backwards, oops! I also got a few CAM pieces that aren't pictured, but I'm looking forward to tinkering with them! Looks like Robecca is losing her head from all the excitement!!! Congrats on having TWO of the Three-Eyed Ghouls! Are their faceups different? Looks like their eyebrows are different colors? Would you mind doing a side by side pic of them? I have the head/arms/legs for one, haven't yet identified a body solution for mine yet. Your background is cool too, a water mural??? And I like the cornrows on (?) Ghoulia. Both Robecca and Elle had their heads removed. A lot of them were customizing projects by the prior owner. One of the ghouls does have a faceup started, which was done by Abbinormal. 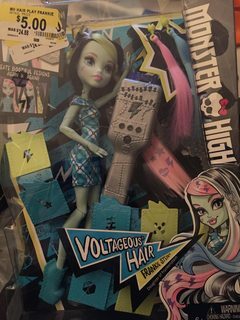 I'm not sure if the new Ghoulia style was done by her, since she seemed to indicate that the bangs were created by someone else and left the doll with a bald patch. 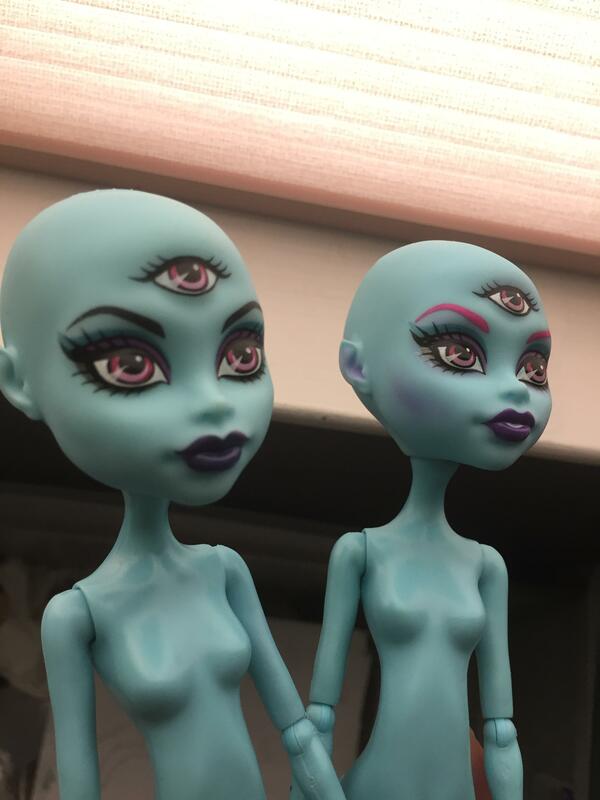 I've already packed the dolls away so I can't get a side by side comparison shot of the two for at least another two weeks, but the rightmost one has adorable purple blushing and the mouth is open a bit, as well as the eyebrow color being painted over. Cool! Sounds great, thank you!!! I ended up making one last rummage through my dolls to decide which ones I REALLY wanted to bring for the initial flight (a bulk of my collection is in a 50 gallon container in storage, no way I'm bringing all of them at once!) so I'm able to get a few pics for ya! There's some adorable blushing inside the ears I missed initially! GAH! Three-eyed Ghoul Twins!!!! Totally in love. Thank you for the pics. Makes me want to find a torso for my ghoul asap. 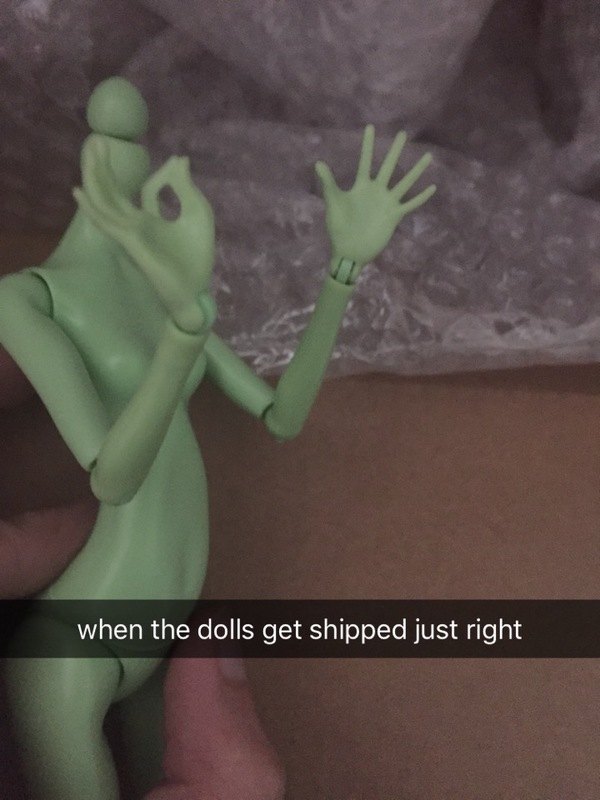 The one with the ear blushing, was she a partial custom under way? When do you leave? Good luck with your packing! I think so? Abbinormal mentioned that a lot of these were for customs that she no longer had the time for or something like that. Which I totally understand, they're very time-consuming! I leave on Wednesday. Thanks! I'm super nervous haha.